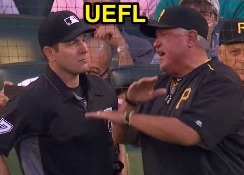 HP Umpire Ben May ejected Pirates Hitting Coach Jeff Branson and Manager Clint Hurdle for arguing a strike one call in the top of the 5th inning of the Pirates-Mariners game. With none out and none on, Pirates batter Matt Joyce took a 0-0 curveball from Mariners pitcher Hisashi Iwakuma for a called first strike. Replays indicate the pitch was located over the heart of home plate and at the hollow of the knee (px -.139, pz 1.634 [sz_bot 1.660 / MOE 1.577]), the call was correct. At the time of the ejection, the Mariners were leading, 2-0. The Mariners ultimately won the contest, 5-2. This is Ben May (97)'s second, third ejection of the 2016 MLB regular season. Ben May now has 9 points in the UEFL Standings (-1 Previous + 2*[3 AAA + 2 Correct Call] = 9). Crew Chief Mark Carlson now has 3 points in Crew Division (1 Previous + 2*[1 Correct Call] = 3). This is the 88th, 89th ejection report of the 2016 regular season. This is the 34th Manager ejection of 2016. This is Pittsburgh's 8/9th ejection of 2016, 1st in the NL Central (PIT 9; CIN 5; CHC 2; MIL, STL 0). This is Jeff Branson's first career MLB ejection. This is Clint Hurdle's 3rd ejection of 2016, 1st since May 24 (Larry Vanover; QOC = U [Throwing At]). This is Ben May's first ejection since May 7, 2016 (AJ Hinch; QOC = N [Balls/Strikes]). Wrap: Pittsburgh Pirates vs. Seattle Mariners, 6/28/16 | Video available via "Read more"